Sonia Choquette is a legendary spiritual teacher, Hay House author / radio show host, globally celebrated for her sixth sense and storytelling skills. 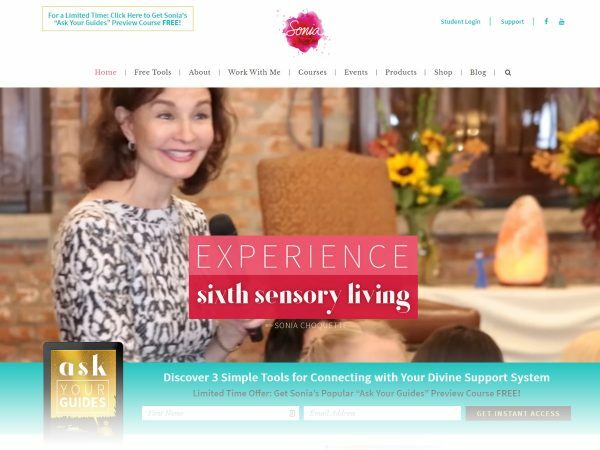 Her legacy website absolutely did not reflect her leadership role in the self-help industry, and it was our pleasure to fix that! One of the most common challenges for web design and marketing agencies like ours is getting our clients to produce content. Not so with Sonia Choquette. Sonia’s the author of 24 internationally best-selling books. She’s produced over 14 online courses and branded product lines. She’s constantly speaking on international stages. This powerhouse intuitive and creative dynamo has absolutely no challenge delivering content. Instead, the primary challenge with this brand & website redesign project was to clean up roughly a decade’s worth of “technical debt” — the (often) expensive result of choosing quick fixes over fully planned solutions, the latter of which might take more time and/or budget upfront, but will almost certainly make life easier/cheaper in the long run. Thankfully, Sonia and Ryan had the foresight and courage to give us unflinching freedom to really do this right, to rethink the entire platform from the ground up. We went into it with the mantra of: How do we make Ryan’s life easier when he goes to launch all of these products, courses, events, vlogs, etc? We were able to properly plan the systems and build Ryan custom tools to manage his day-to-day online marketing activities (without needing to ping a programmer or web designer every time). More expensive on the front end, yes, but over time they’ll see real savings in both budget and execution time. WordPress, our website platform behind SoniaChoquette.net, began way back in the day as a pure blogging tool. It has evolved a lot over the years. As this project demonstrates, today’s “WP” is a robust, highly customizable content management system that can be so much more than a blog with pages and comments. Our Peaceful coders on this project — Ben Turner & Crispin Bixler — both relish the opportunities to bend WordPress and shape it around our clients’ individual businesses, which you’ll see highlighted in the list below. Brand Identity* We kicked the project off with our highly-effective “Mood Board” design process which allows us to pull aesthetic flavors out of the ether and onto the page, from nebulous to tactile. We tap into our client’s distinct tastes without blowing budgets on full-blown web page designs. This established our beautiful new color palette and design patterns that give the site a distinct, modern, and cohesive feel. Custom WordPress Theme Our new “Choquette” child theme is built upon our proprietary, foundational parent theme (from which we built WordPress themes for Brendon Burchard, Ory Shihor, and many other prominent thought leaders). This gives us a great headstart with several marketing elements that our clients enjoy, like drag-and-drop opt-in and testimonial widgets. Custom Page Design Sonia Choquette is not a “template” personality, so we took extra care to create one-of-a-kind visual experiences on key pages throughout the site. Very rarely will you come across a page in the top nav menu that feels “template-y.” Does this approach cost more? Of course. But design equates to intention, and we strongly believe that visitors to the site will notice — either consciously or subconsciously — and feel that this brand and the woman behind it are truly something special. Custom Post Type: Events Sonia speaks often and all over the world, so we set out to: a) make fans’ lives easier when searching for that next Sonia experience to attend; and b) make Ryan’s life easier to deploy new events throughout the site without having to manually update 3 different pages. When he creates a new event, our system builds a beautiful event landing page and distributes the event to the Events page. If it’s categorized as a “Featured” event, it’ll automatically post in chronological order to the Home page Events section as well, complete with the # of seats remaining. All managed from one place! Custom Post Type: Courses With 14 courses on display (and many more on the way), the previous website’s Courses page felt unwieldy and, well, lacking in design intention and cohesion. We gave each of the courses a nicely designed “feature image card” and segmented them out by course category to make buyers’ interest-based navigation snappier. As with the Events custom post type, if a Course is categorized as “Featured,” it’ll automatically show up on the Home page in the Featured Courses section. Custom Post Type: Products Sonia’s legacy Products page had a lightbox concept that (sort of) worked on desktop, but fell apart when opened in a mobile device. It was also terribly difficult for Ryan to make even the slightest edits because the code was pretty gnarly. So we spruced it up with a fresh CSS3 Lightbox design and made it super simple for Ryan or any other non-coder content manager to add products to the appropriate place in the grid (Books, Card Decks, Audio Programs) without touching code or fussing with design. Custom Visual Composer Elements We’ve made it easy for Ryan or any other site administrator to insert beautiful testimonials, product / event / course callouts, branded buttons, Facebook comments, and 1-click subscribe buttons anywhere on the site — without messing with code. Server & Email Migration This is another one of those deliverables that’ll never get noticed by a site visitor, but makes plenty of difference to online security (not to mention Sonia’s bottom line). Previously her digital assets were scattered amongst 3 different servers with DNS and nameservers flying every which way. We cleaned it all up and condensed to one powerhouse server on our fav hosting company, LiquidWeb. * Special Note: Peaceful Media did not design Sonia’s new logo. Working with Peaceful Media has been an exciting and joyful experience. Their creativity and intuition led the way in creating my gorgeous and powerful new website. I can’t be happier with the end result.